Haynes Design Services, LLC was established in 2001 as a full time glass and glazing shop drawing and drafting firm. Our individual experience goes well beyond those years in the industry however. Rest assured we have worked not only in the submittal and shop drawing process, but in all aspects of project management, sales, estimating, billing and purchasing, as well as in the fabrication and field installation end as well. This experience is not exclusive to just the curtainwall, storefront and commercial window fields, but with the automatic door industry, commercial hardware, hollow metal/steel windows and doors. We also have extensive experience with electronic and state of the art door hardware including access control and security. We have worked on many military, prison and government projects. 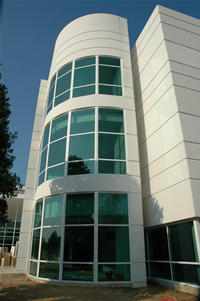 We have experience with many of the more strict building codes including Miami-Dade County as well as with some of the newest bullet/hurricane large and small missile impact resistant curtainwall and storefront systems. Over the years there has been a steadily growing need for qualified people to provide shop drawings. Manufacturers often are understaffed and over booked and are unable to produce shop drawings in a timely fashion to meet the fast pace of the commercial construction industry. While a lot of glass and glazing firms have staff that can produce shop drawings, a lot of our customers find, after using our services, that it is much easier and cost effective to outsource this aspect of their business. Often it is the project managers that end up spending a large amount of time involved in the submittal process which takes them away from time spent managing other projects as well as sales for new work. We can provide you with a service that seamlessly takes care of your shop drawing needs while making it look to your customers like this is being handled either in-house or by the aluminum manufacturer (many aluminum manufacturers are also our customers). Your professionally prepared drawings will have your name/logo only in the title block so as to appear that they were done in house. You can provide a single source/coordinated set of shop drawings while using multiple manufacturers that best meet your budget and free up your own staff to work on what they do best. We pride ourselves on providing shop drawings where first submittal approvals are completely normal and expected. Our drawings will be an extremely accurate compilation of the architecturals, aluminum manufacturer's standards as well as the information you give to us. We save you time in the submittal process by eliminating the need for multiple submittals just to get architectural/contractor approval. © 2008 Haynes Design Services LLC All Rights Reserved.